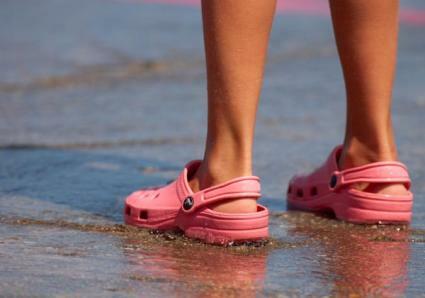 The Beach is the style Crocs Shoes are known for. It's their most popular style. Often, when someone hears the brand named, they automatically think of the brightly colored rubber shoes. They come in neutrals like black, brown, khaki and butter. Too bland? Never fear. You can ward of being struck by lightning AND make a vibrant statement--all with one shoe. How do colors like turquoise, fuchsia, bright yellow, lime and orange sound? Great! Thought so. These are the shoes to wear with anything casual and get people looking at your feet. Similar to the Beach style that put the shoes on the map, there's the Cayman style. It still offers all the same benefits for your feet as the Beach. You get ventilation so your feet aren't stinky and sweaty. You get a shoe that conforms to your feet. You get the comfortable foot bed that makes it feel like you're walking with rubber balls on your feet. Your foot doctor would be proud! What--no foot doctor yet? Maybe you'll never need one if you keep wearing Comfortable Shoes that fit well and offer more support than a best friend post-breakup. The Cayman's also available in a wide variety of colors. Crocs shoes aren't limited to the Beach and Cayman styles. They offer flip-flops, boots, regular shoes and footwear for kids. The Athens for example, is a flip-flop available for men and women. Not just any flip-flop, it offers circulation nubs to keep your feet and legs healthy. They offer something a great deal of similar shoes don't--support. They're squishy and hug your feet. Traditional flip-flop sandals are flat and don't hug at all. Feet slide around and arches start to hurt. They're not available in as many colors as the Beach and Cayman, but there's still a range from neutral to vibrant. The Georgie looks comical for a rubber boot. Especially in colors like sea blue and lime green. You won't be laughing when you're wearing them--especially if you get caught in a downpour! They're made from the same material as the originals, so you know they're good quality. There's no room for water or snow to get in and make your feet cold or wet. They offer support and again, those circulation nubs Crocs shoes keep referring to. The only downside to these is that they don't come in men's sizing. They are available in Women's and Kid's sizing, though. It's not just the ventilation that's keeping your feet from smelling bad. They're anti-microbial because of the nature of the Patented Closed Cell Resin material they're made of. Bacteria and fungus have a hard time growing there, and that's what causes foot odor. Something else that makes them phenomenal shoes is the way they mold to your feet. The PCCR reacts to your body heat and then sculpts to your own feet. There's built-in arch support, enough wiggle room in the toe box, careful orthotic heel styling and tarsal bar positioning. Crocs shoes are also anti-slip, so you can feel safe and comfortable in them. The clogs are actually recommended for people on their feet all day who have a slip-hazard. You can buy them right off the Crocs Shoes website for reasonable prices. If you go with Zappos, you get free shipping and free return shipping. You can also have reviews at your fingertips by other consumers who've bought and worn the shoe in question. The shoes seem to cost a bit more on Zappos, but the shipping's free. Weigh that in your shopping decision. You can find knockoffs in stores like Target, Payless and Wal-Mart. They're still cute, but they're not usually as skillfully designed as the real thing. Also, they take a little more breaking in than regular Crocs.